Gilenya and Me: I found Greg House's Cane! Anyhow, having used a cane quite a number of times in the past -- usually with every flare -- I have often thought I would like a nicer one than the utilitarian silver one that I've got. I'd never get rid of it, tho, because that cane was my father's and when I am using it and have my hand on the handle, it feels like we are holding hands again. Plus it's got his "I Voted!" sticker on it still from the last vote he cast. He never did find out who won because that was the year of the Hanging Chad. He died before the recount was finished. But I digress. I have seen people with cool canes, but I can't for the life of me find any. Today I googled "stylish canes" and hit the jackpot. Apparently googling "cool canes" wasn't getting me the same results. You really have to have a diverse vocabulary to google stuff with any finesse. 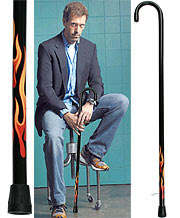 I visited Fashionable Canes and hit the jackpot, finding Doctor House's (Hugh Laurie from the show House on FOX) cane with the flames on it. Woohoo!! Ever since I saw the episode where he found the Flame Cane in a head shop, I've wanted one. For $27.95 plus shipping, I just may get one, too! At least if I had that cane waiting in the wings to make its debut, it would make my next relapse (not that I plan on having one) something to look forward to.